Peter Lalor was an Irish migrant who led the rebellion of the Eureka Stockade. In his early days he was relatively disinterested in politics, but the Eureka rebellion sparked a passion for justice that began his political career. 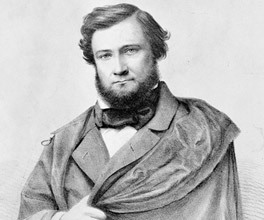 Born in Ireland in 1827, Lalor migrated to Australia in 1852 and headed to the Ballarat goldfields in 1854. Although aware of the growing resentment towards the government's laws regarding diggers, Lalor was initially not involved with the miners' rebellions. ...knelt down, the head uncovered, and with right hand pointing to the standard (flag), exclaimed in a measured tone: ‘We swear by the Southern Cross to stand truly by each other to defend our rights and liberties. A universal well-rounded Amen was the determined reply. Austrailan National University, 2006, Austrailan Dictionary of Biography Online, Canberra, viewed April 2011, <http://adb.anu.edu.au/biography/lalor-peter-3980>. This quote was taken from the online version of the Australian Dictionary of Biography, which has reliable, comprehensive information on any important Australian who died before 1980. Although the diggers were overpowered by the stronger, better-armed police and military, Lalor escaped with a wound to his arm, which he later had to have amputated. A reward was posted for information leading to his arrest, but no one claimed it. There was enormous public sympathy for the miner's cause, and Lalor's heroism in leading them at such odds. After the Eureka miners were later aquitted, Lalor went on to take a seat in the Victorian Upper House, continuing to fight for the rights of the miners and the common working class. However, Lalor's political stance could be viewed as inconsistent. He supported protection of local industry, but was also an advocate of assisted immigration. He supported land reforms, but also advocated the sale of land to the wealthy middle class, instead of working-class men who lacked the money to fully develop it. His conflicting stances made him unpopular with some members of parliament, but he continued his career until 1887. When his wife and daughter died shortly after one another that year, Lalor lost the heart for politics and resigned. He died two years later. In 1854, Victorian gold miners united to protect their rights. The resulting battle was the Eureka Stockade: Australia's most famous rebellion.